October 14th, 2018 (11:55 PM). So, are there any working IV and EV Gameshark or AR codes? I’m one of those people who likes to play through the game with ideal Pokémon. October 16th, 2018 (7:43 AM). Gameshark codes in general don't seem to work on the game. October 17th, 2018 (10:25 PM). I'm not sure if this was reported, but there seems to be a bug with the new cries and Growl. Every now and then the Growl "voice" glitches up, and you hear some odd, high pitched sounds before the cry. EDIT: Also I ran into a text overflow, right here. Found a small text bug. When opponent uses Sticky Web, the text says "Foe (pokemon) is affected..." but the slow animation still shows properly on your team. Hi i reaaly love ur game- what a fantastic hack. Hey, I love your game. I especially love that the VS Seeker is instant. I was asking around on how to do that in one of my FR hacks, but the one alternative was pretty lengthy and a bit complicated. Would you mind showing me what you did? There are two different items that tell you the IVs and EVs of your Pokemon. The two items are the IV checker (0x71) and the EV checker (0x72). You might be able to hack in these items into your inventory if nothing else works. In addition, the status screen shows a star next to a Pokemon's stat if the IV for the particular stat is very good. Hey, dont know why, but after patching the firered rom, the image crashes in NO$GBA and fails to load in Desmume. Do you know why? Odd, no clue why I wouldn't work on other emulators. The emulator I use is VBA; if it does not work on VBA, the issue might be with the patching. October 21st, 2018 (4:32 AM). Edited October 30th, 2018 by dsbn. Freeze Dry is a bit buggy on dual type water pokemon (should be super effective against water types but it doesnt register properly ex Skrelp and Volcanion; damage done and text says "not very effective"). Also, the description is that of a draining attack (Absorb, Mega Drain, Giga Drain). Gogoat should be able to learn Surf but is unable to. Unburden ability activates but does not show the increase speed animation on the pokemon. Minor issue. Trying to heal your pokemon with nurse Joy in Rush tower causes the game to crash. Text slowly lags, then the screen flickers blue-black, then the game and emulator hangs. Not really game breaking since you can heal elsewhere. Recoil moves seem to do a bit more damage to the user than usual? Should be 10% for Flare Blitz and Wild Charge but seems to do 30%, whereas Head Smash should do 50% to the user but only does 30%. Might be a consistency thing, and if is the case just disregard this. Would appreciate a list of moves the move tutor in Rush Tower teaches since she does notnshow you if you dot have enough BP (how much is enough?). Serperior uses Aerial Ace, 10% HP remain. Sawk uses Brick Break, KO Serperior. Pyroar uses Charming Cry, Throh down to 65% HP. Pyroar uses Lava Plume, Throh down to 15% HP. Throh uses Circle Throw, KO's Pyroar, immediately sends out Drilbur lvl 10 without me choosing (Drilbur for HM). Game then asks me to select a pokemon to switch to EVEN IF DRILBUR WAS ALREADY SWITCHED IN AUTOMATICALLY. Since my entire team was wiped out and I had a Revive, I chose Drilbur, who was already out (I tried cancelling but the game wouldnt let me) to but time for a Revive. Drilbur is sent out again, but his sprite now bugged and so is his name. Game crashes. Will edit this post to avoid multiple posting. These are all so far. Sorry for the lack of screenshots. November 2nd, 2018 (3:58 AM). Hello, any update on all the locations for where you can find each Pokemon? November 2nd, 2018 (8:04 AM). This is my favorite ROM hack. No unrealistically high number of Pokemon and a great number of features that really makes for a fresh take on FireRed. Well done! December 2nd, 2018 (1:50 AM). Should still be mostly accurate, but I might have to look at it again. Which Pokemon are you looking for? December 2nd, 2018 (4:24 AM). December 3rd, 2018 (7:00 AM). Edited December 3rd, 2018 by PkmnTrainerKonner. Is the Genesect in Cerulean Cave meant to be shiny or did I just get extremely lucky? Also how can I get Espeon and Umbreon since there's no day and night cycle? March 12th, 2019 (12:11 AM). Edited March 12th, 2019 by PageEmperor. Well, after god knows how long, I’m back after playing your hack, and I must ask, where can I get a thunderstone here? It’s not being sold at the department store as much as I know, does it become purchasable later like the trade stone? Thanks in advance! Edit: Okay I completed the 6th gym, now I have the Thunderstone. Everything is fine now. 1 Week Ago (10:36 PM). Edited 4 Days Ago by Mystery Man. Normal => boss trainers fight like in the official games, often having stupid sets. Challenge => like B2W2 challenge mode, maybe a little bit harder. Omega => Leaders have 6 Pokemon with more challenging sets. They use legendary Pokemon towards the end of the game. Off => boss trainers don't use EVs, just like in the main games outside of battle facilities. Note on items: trainers do not use items in battle whatsoever. You are welcome to make the same restriction onto yourself for perhaps fairer match ups. Interact with the game console in your ROM. Refer to the information under "Difficulty Modes" to know exactly what it entails. It is in easy mode by default. 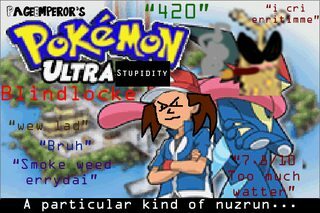 What's the best difficulty mode for Nuzlockes? Why is set mode in the difficulty rating system script? I can change it anytime. Because it increases difficulty? So you do not have to go back all the way to Pallet Town in case you do not like Set mode when grinding, just like in the official games? Why do I need to force it again? Not many people liked it, so why? 1) matches a generation 1 Pokemon they had. 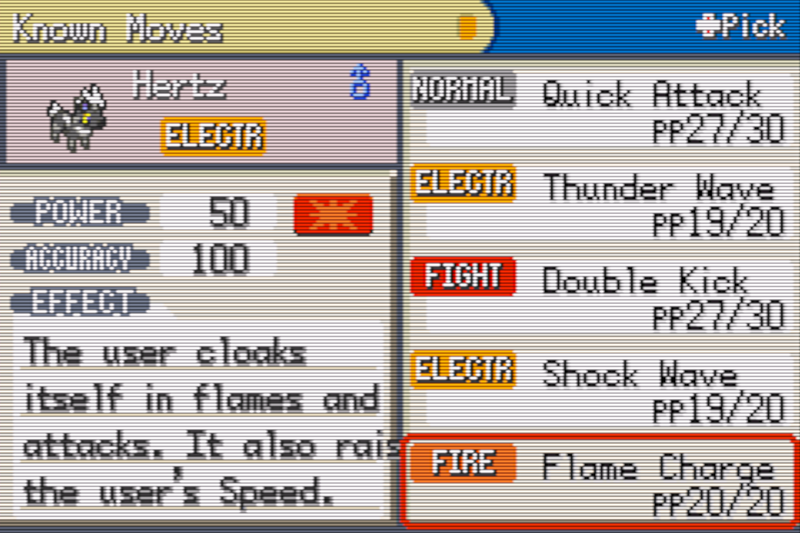 Does this hack have all of the evolution stones the 5th/6th generation Pokemon use? Yes, the evolution stones are in! Where did the fossil guy go? Two Island Game Corner for earlier access. Where can I find the VS Seeker? Talk to the Ace Trainer in the Vermilion City Pokemon Center. What do the seeds do i.e. Life Seed? They raise the IV of an individual stat by a couple of points. You can buy these seeds in the battle facilities such as the one in Rainbow Island. Where is this so-called "Trick House"? The Trick House is in Rainbow Island (the route before Vermilion in the previous versions). You'll need to buy the Prismticket from the mysterious man inside Celadon Mansion/Condominiums. When can I start the Sevii Islands quests? To start the first one, just defeat Lt. Surge and leave Vermilion City. The second one can be started after defeating Sabrina. The last one can be started after defeating the Elite Four (first wave). To start this one, go up the waterfall in Icefall Cave. How do I go to Rainbow Island? The vendor of the ticket to Rainbow Island is in the Celadon Condominiums, the other big building besides the department store. 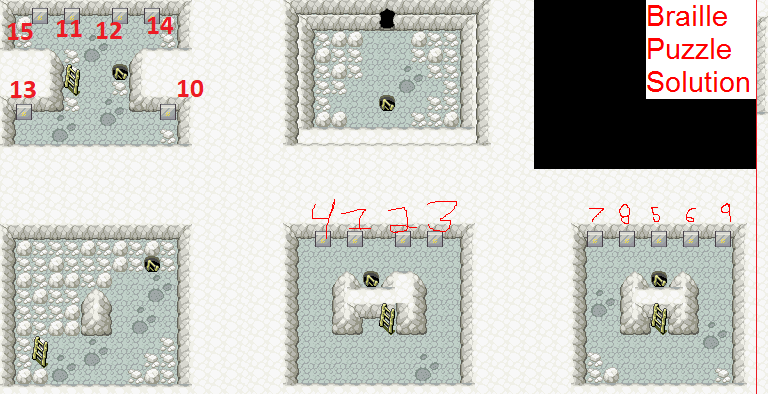 How do I solve the Altering Cave puzzle? How do I find the second Team Rocket warehouse password? You are supposed to beat the main game first. Afterwards, you will be provided HM Waterfall that will allow you to access a Team Rocket event in Four Island's cave. Where can I get the evolution stones? One merchant is in the Celadon Department Store and the other is in Saffron City after you clear Team Rocket. Are the evolution levels the same? Yes. I know it is a little inconvenient, but when distributing the Pokemon, I did take into account the level at which they evolve. Why can't my Pokemon learn this move? How do I evolve Eevee into its other forms besides the original three? You'll find colored stones in the overworld in the Sevii Islands and Rainbow Island. Why did X get a buff? It was already strong enough. 1) It makes sense thematically, to me. 2) Important boss strategy. 3) It was a decent to good Pokemon at best. When you have Pokemon like Chandelure and Haxorus (of which I am not going to deliberately nerf), the decent Pokemon struggle to find their places lategame. The aim with the buffs is to give them staying power and, if they are lategame Pokemon, be more rewarding to raise. Are all later generation abilities, moves, and battle items in? No, and I do not know of a single 3rd generation hack that has everything later generations have. It has most, to give you an estimate. This is still in development, so more will be added as time passes. If you are wondering if Froakie can have Protean in this hack, then yes, it can. Yes, Talonflame can have Gale Wings. Does Aegislash have Stance Change? Ridiculous? Game Freak Aegislash is also ridiculous. I wanted to keep that about it. I found an error. This hack is so broken. Expect a lot more. This is why I am calling it a beta. Odd how < version 1.00 wasn't justification enough for this. Anyways, 1) this project took tons of work, and for the most part, I can say most things work, but I would like for people to report the errors to me so that they could be fixed. Also, this is using MrDollSteak's patch. While really nifty, it still is not perfect, so expect a few battle related bugs. Do report them as I may be able to fix some of them. It's a complete game with a finished main game and a fair amount of post game. I might add more features in the future, however. Does this hack have all 5th and 6th generation Pokemon? Can I obtain them all? Yes, with exception to a few alternate forms. You can also garner Eevee and its evolutions. Tirtouga can learn Ice Punch. Do you even logic? TM editing is tedious. Very time consuming. To save time, I just copy and pasted the fully evolved Pokemon's compatibilities to their pre-evolutions. "lol Carracosta Ice Punch." I thought it would be nice to give it a good physical Ice type move. Also, Wooper can learn Ice Punch too, so go destroy Game Freak with your Aristotle-tier logic abilities while you are at it. Are the 5th and 6th generation Pokemon added or do they replace Pokemon? No. They replace the first generation Pokemon. The second generation Pokemon are replaced by the 6th generation Pokemon. How do I evolve Pokemon that normally evolve through trade? Enigma Stone (Celadon Department Store): Pumpkaboo, Phantump, Spritzee, Swirlix, Karrablast, Shelmet, Eevee. Where can I get Tyrunt/Amaura? After doing Lostelle's quest, go into the cave that is located near Three Island's port. Where can I find Eevee? Gentleman in a Five Island islet. Also, maybe the egg shop in Four Island. How can I get Floette's alternate form? While Floette's eternal form as well as its associated events are kind of finished in the game, it remains inaccessible as of 2.08. Anyway to do something like a Wonderlocke? Not a Wonderlocke exactly, but in Pewter City, there is a building called the Wonder Egg Shop where you can buy eggs that can hatch into any Pokemon in their first form besides legendaries. What are the locations of the Pokemon? Tyrunt … Fossil in the Three Island cave after you complete first Sevii Islands quest. Amaura … Fossil in the Three Island cave after you complete first Sevii Islands quest. 1 Week Ago (5:07 AM). Any chances for a future update that could expand the game and maybe add the Johto region and some Pokemon from Alola? 1 Week Ago (11:40 AM). I'm not so sure. I think the game is long enough as far as content goes, though I have been entertaining the thought of adding more postgame, like maybe one or two more islands with a difficult postgame dungeon in one of them. I've also had ideas for another weirder battle facility. These islands would have some of the more interesting Pokemon from the other generations, including Alola, since I have kind of exhausted the 5th and 6th generation Pokemon as far as strategies go. 1 Week Ago (12:06 PM). Really wanted to ask as to which difficulty setting is good for Nuzlocking, the easy or the moderate level? Thank you! 1 Week Ago (12:13 PM). Edited 1 Week Ago by Mystery Man. I would go with "Normal" for trainer sets since I based the trainer sets in that mode off of the official games moreso than anything else. "Challenge" and "Omega", I reckon, would have too many unpleasant surprises for a nuzlocker. So yeah, the easy difficulty. 1 Week Ago (4:24 AM). Say, can someone please tell me where I can find a shiny stone to evolve my Minccino? Thank you! 1 Week Ago (4:55 AM). 6 Days Ago (7:59 AM). 5 Days Ago (11:12 AM). Edited 5 Days Ago by Mystery Man. After addressing the initial FAQ issue, I have come to realize how much of a fantastical unreadable mess the document was, so I have decided to give it a structure and format it appropriately. I have also added new questions that I think could be pretty helpful for people in general. Think something helpful is missing from the document? Let me know! 4 Days Ago (8:43 AM). I just finished up playing Kanto Black on Chaos mode and I had a real blast! I've noticed a few oddities like Mandibuzz and Hydreigon getting affected by sticky web despite being flying (levitating) Pokémon. Also, Helioptile doesn't have a cry inserted. Thank you so much for an amazing ROM Hack! 4 Days Ago (8:29 PM). Thank you, added those oddities to my log. I should be able to at least fix Helioptile's cry. #547 Link to this post, but load the entire thread. 3 Days Ago (8:03 AM). #548 Link to this post, but load the entire thread. 2 Days Ago (1:03 PM). I would like to someday, not sure when, but I don't think I'll be adding anything major other than maybe some more extensive postgame and maybe a few other conveniences for the main quest. And of course, bug fixes. I won't do anything that would make saves incompatible though. #549 Link to this post, but load the entire thread. 2 Days Ago (5:10 PM). An extended postgame would be much appreciated but in any case, thank you Mystery Man for making this fun hack. #550 Link to this post, but load the entire thread. 14 Hours Ago (11:01 AM). - Removed the 10% stat boosts granted by the badges. Later generations stopped doing this and I also think this gives the player an unfair advantage. This will make the game more difficult, maybe to an even greater degree in the harder difficulties due to how speed works. - Sticker guy's demands in Four Island are less ridiculous and more in-tune with the hack. 200+ link battles is no longer a requirement if you want all of his stickers, for example, and now measures the number of battle facilities you have conquered. - For some of new NPCs, changed previously non-nonsensical, stupid text to maybe something even stupider. - Paralysis and Burn damage have been updated to how generation 7's works. *Difficult postgame dungeon with various legendaries and extremely powerful trainers, kind of like Sphere Ruins in Vega without the crazy puzzles. *Double Battle island of which I will call, idk, Duo Island? Might give this island a gym that does not provide a badge, but instead a rare item. All times are GMT -8. The time now is 1:18 AM.